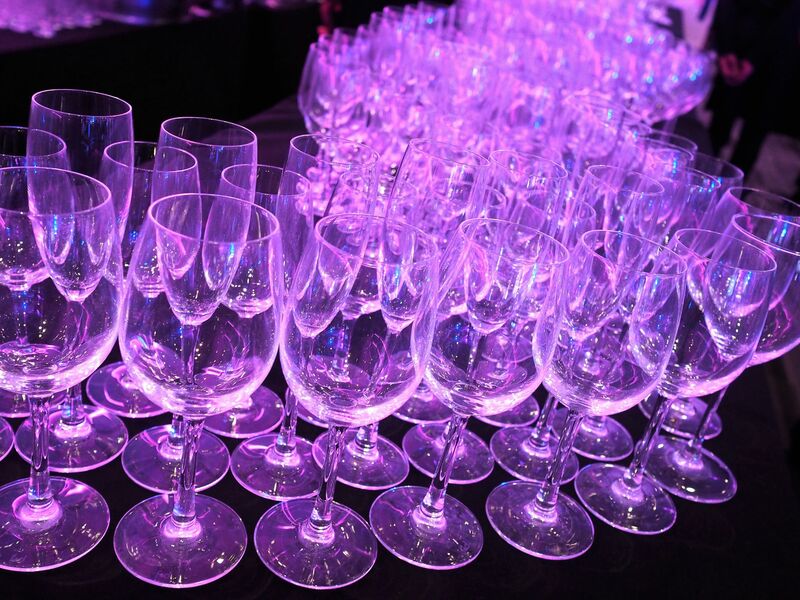 As I said in my previous post, I was in London over the weekend for 100% Optical, the largest optical event in the UK, which brought together more than 8000 professionals to learn, network and discover. Throughout Saturday and Sunday, we saw exhibitions, innovations and catwalk shows. In equal measure, these were insightful, exctiting and informative. 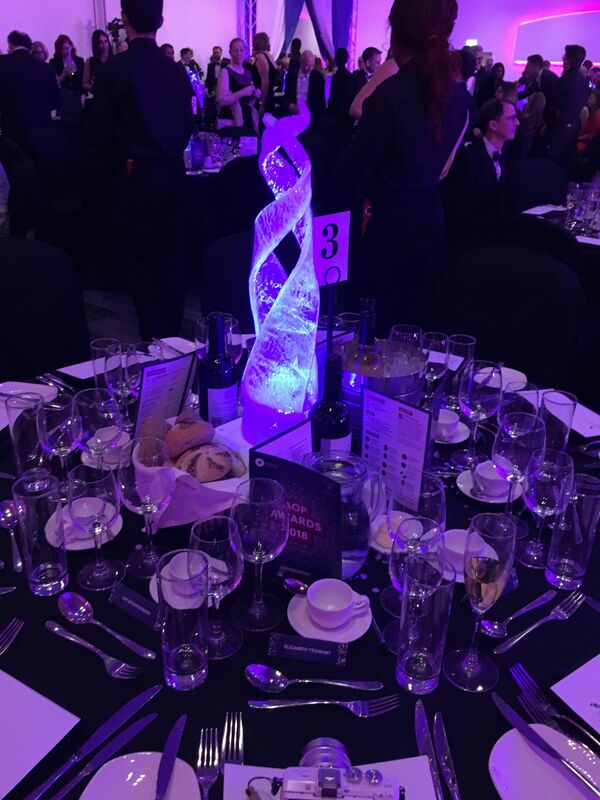 The highlight of the weekend though was the black tie event which took place at ExCel at The Royal Victoria Dock, on Sunday evening. 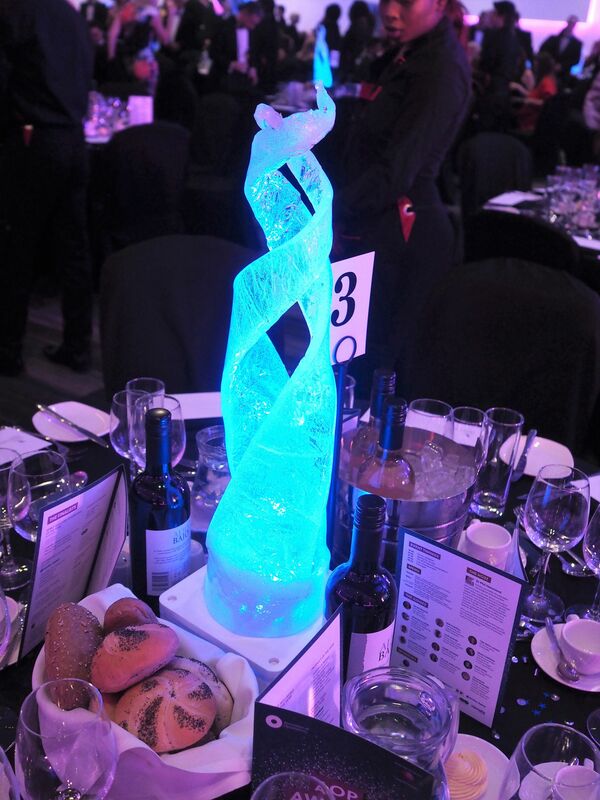 It was the AOP Awards, an industry awards ceremony and I was a member of the judging panel. This is in association with the monthly column I write for our professional journal, Optometry Today. It was the first such event that Ian I have attended together, so it was very special. As soon as I spotted this dress, I fell in love. The colour, the high-low gossamer skirt over the shorter stretchy pencil skirt. The beautiful shade of blue, the belt. Everything. It was a Cinderella moment because there was just one left and it was in my size. I tried it on and bought it in less than ten minutes. (It’s from Coast and I got in the sale just before Christmas). It’s tricky taking photographs when it’s dark, especially when it’s windy, but Ian was his usual patient self and we persevered! 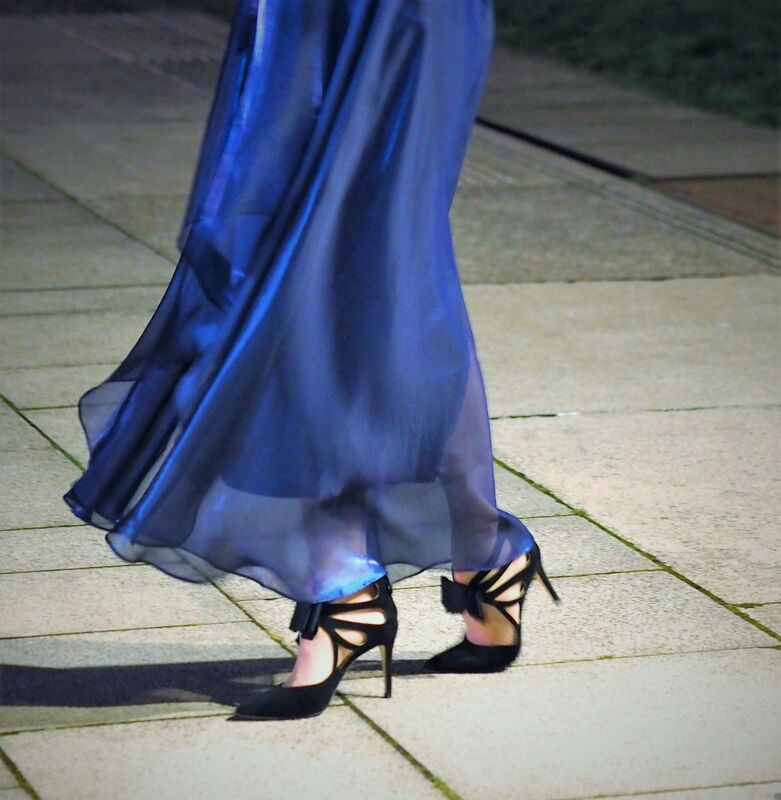 Unlike the red carpet photographs, these ones don’t show off the gorgeous hue to its full potential but it shows the movement and shape of the skirt. My shoes are three years old from Boden. I love the combination of black with blue and the fact that the bow is a bit like a bow-tie. 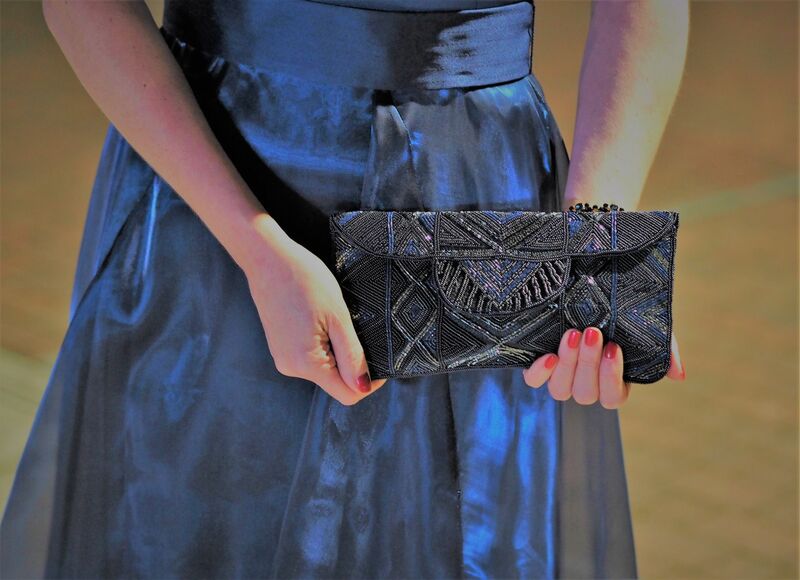 The *black and blue beaded clutch brings together the blue from my dress and the black from my shoes. It has an optional handle, but I wore it as a clutch. I added a *midnight blue beaded stretch bracelet. I have one in red too which I wore over Christmas with my red pleated velvet skirt. These bracelets are eyecatching and add vibrant sparkle and are comfortable to wear because they’re stretchy. 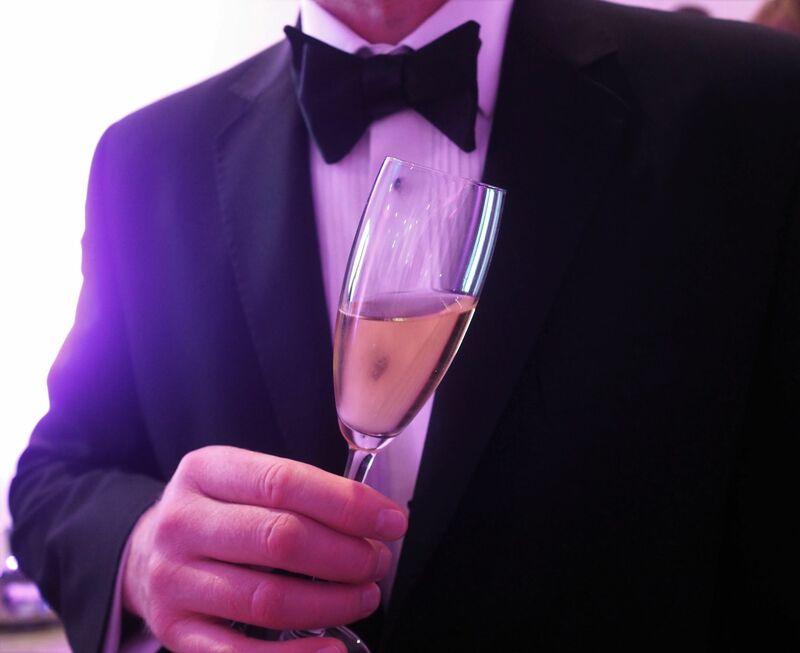 After walking the red carpet, there was a champagne drinks reception, followed by dinner. The room and table looked great and dinner was lovely. 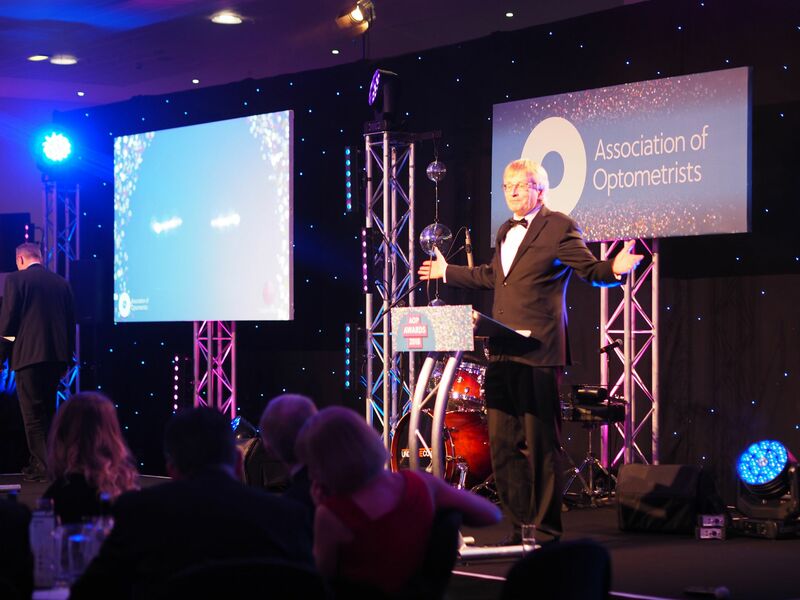 Dr Phil Hammond, (Trust Me, I’m a Doctor), gave an excellent after-dinner speech and presented the awards. 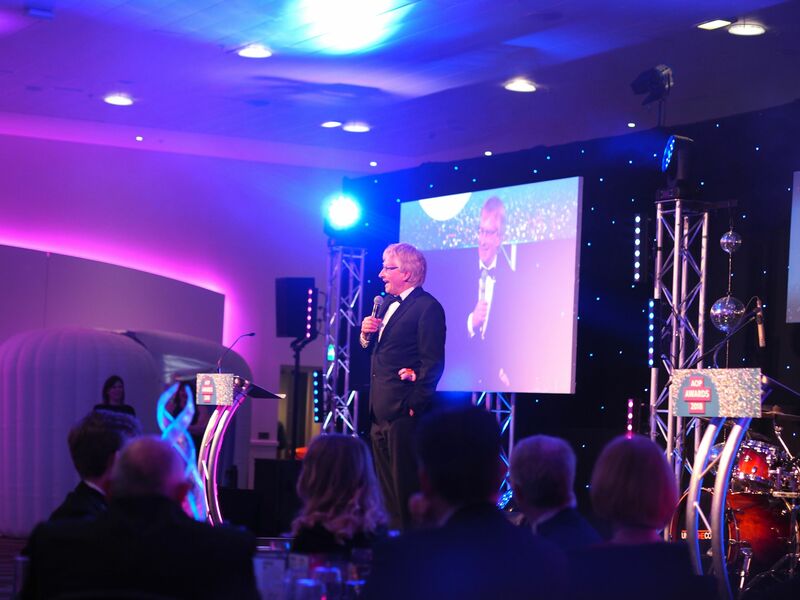 It was a brilliant evening and one we’ll remember for a long time. A lot of fun and a lot of dancing. In my next post, I’ll write more about the exhibition itself including some candid shots of me doing some filming for the Optometry Today website! *Disclosure: This isn't a sponsored post. 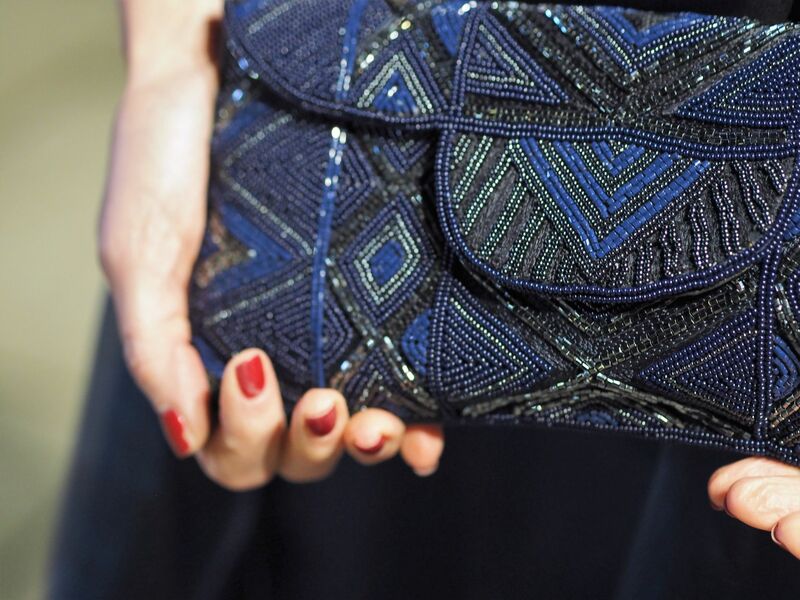 The blue bracelet was a gift from Olivia Divine and the beaded clutch was a gift from Aspiga. 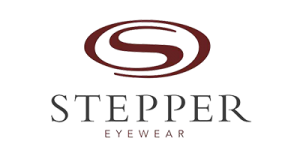 Entry is free to 100% Optical. 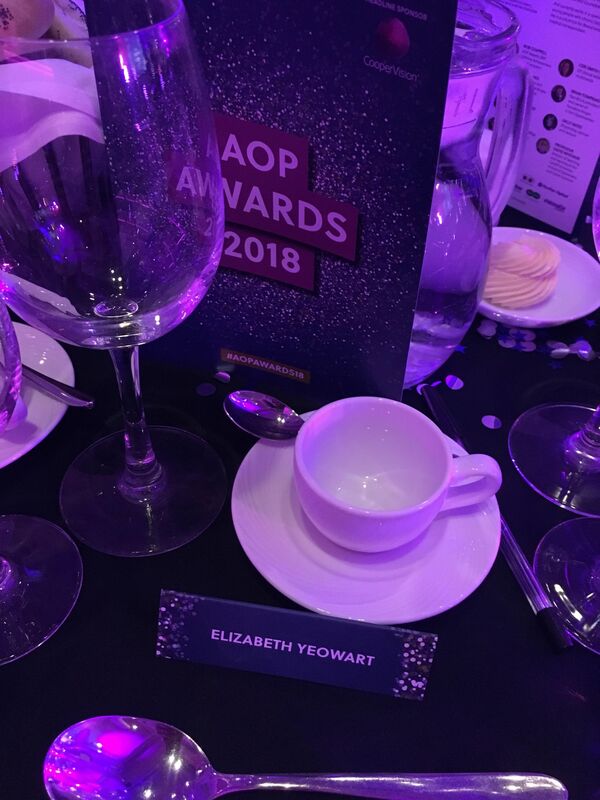 Ian and I were guests of the AOP for the awards ceremony because of my role as a category judge. All opinions are honest and all content is my own. Thank you for supporting the brands that support my blog. 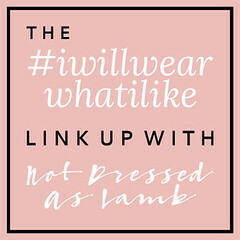 This post links up to I will Wear What I Like, The Saturday Share and Brilliant Blog Posts. Next Post 100% Optical: Frames, Fashion Shows and Filming. What a wonderful dress, you look really spectacular, beautiful and very elegant! I love the fabric and this design. 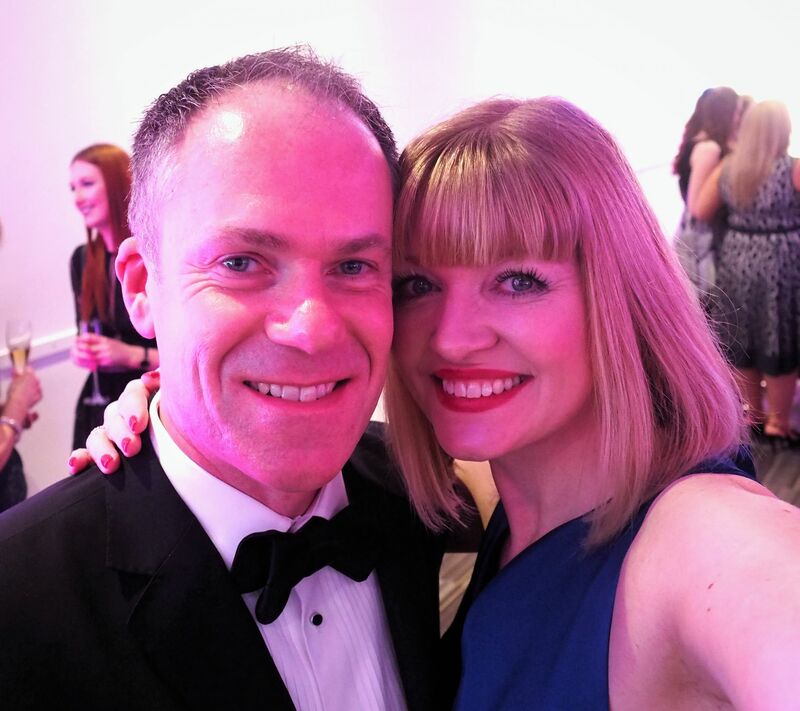 Liz I am SQUEALING with excitement for you over this post – the event, the photos, the Instagram husband (what a keeper!) and the DRESS, OMG what a dress!!!!!! 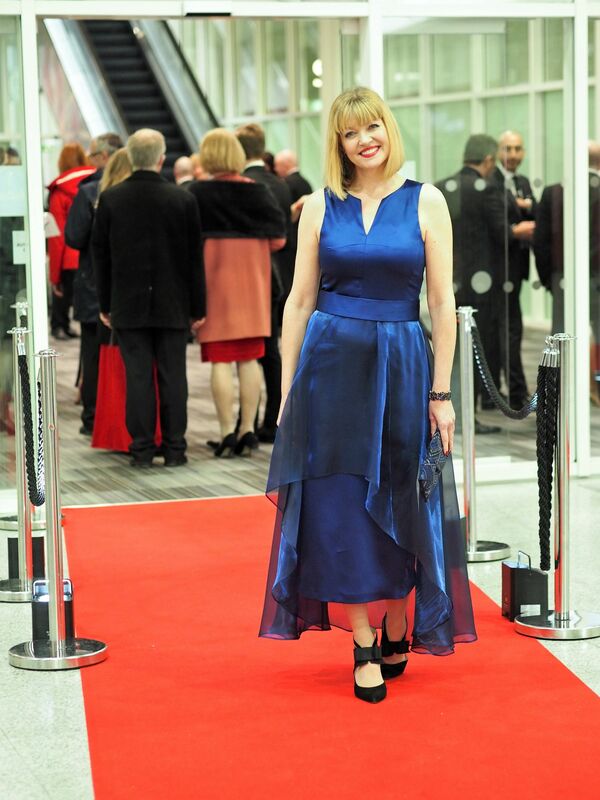 Ian has done himself proud with these amazing photos – honestly they are some of your most spectacular (night time/red carpet photos are sooooooo difficult). But to to be fair, he has a great model… you could rock up in a potato sack and blow everyone away!! Oh Catherine!!!!! Thank you so much. Wow, what a lovely comment. Well yes. Ian is definitely a keeper. He’s wonderful and is the best Instagram Husband!! So patient and willing to help and support. It was very tricky trying to get photos because I don’t like using flash but he never ever complains or gets fed up. And he looks amazing in a dinner suit too!!! You look at home on the red carpet, Lizzy! Very nice dress! What a beautiful evening! I love events when you can get to know other in your industry and build some great professional relationships. Beautiful dress Lizzy and love the bag and shoes with it! 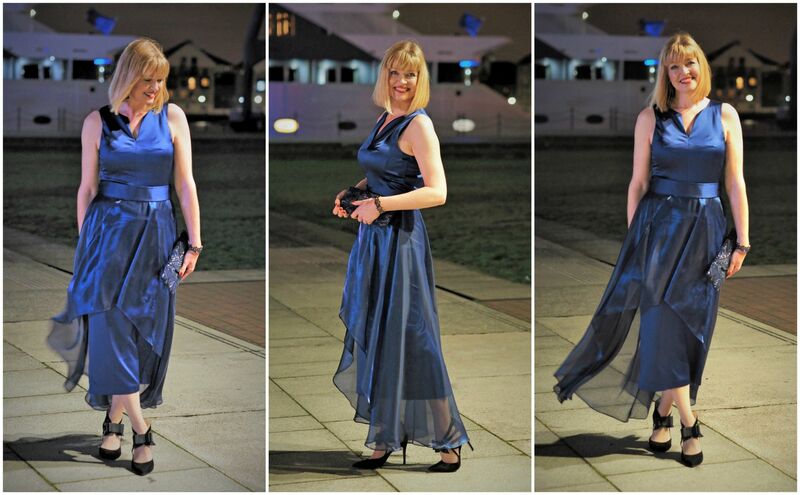 Lizzy, you look absolutely stunning in that blue dress – like a million dollars! That shade of blue is one of my favourites, it’s so rich and lush-looking. It certainly looked like a fabulous event. Glad to hear you had such a wonderful time! Ian looked very handsome in his suit too. What a gorgeous couple you are. Wow Lizzy!! You have nailed it. That beauty on Red Carpet is not less than any Celebrity. Awesome design and color. Will be buying such soon. Thank you so much for sharing it.